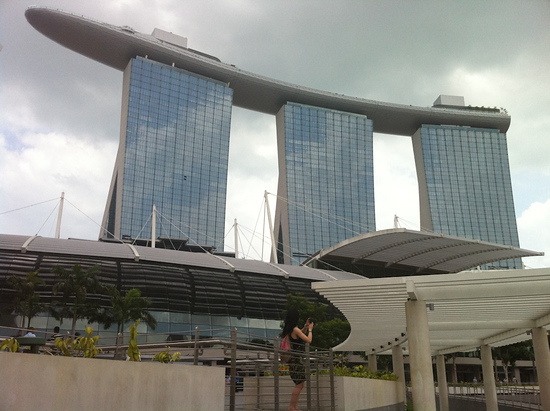 Marina Bay Sands is Singapore’s latest attraction to entice tourists to stay longer in the city. Here’s a quick rundown of what it has to offer. Marina Bay Sands is the new icon of Singapore – three skyscrapers supporting topped by a huge platform built directly overlooking Singapore’s historic bay area, directly across the water from the historic Fullerton hotel and the striking durian design of the Esplanade Theatres. Opened in stages over 2010 and 2011, Marina Bay Sands is an entire entertainment complex centered around the Marina Bay Sands Casino – there’s also the Marina Bay Sands hotel, shopping mall (the Shoppes), state of the art exhibition , an Arts and Science museum, and “celebrity restaurants”. The advent of casinos in Singapore has been very controversial (the other casino is located at Sentosa World) – previously gambling was illegal within the city-state. The decision was taken to create the casinos in order to boost Singapore tourism – there is a hefty surcharge for Singaporean citizens who wish to play in the casino, used as a method to try and control gambling addiction. 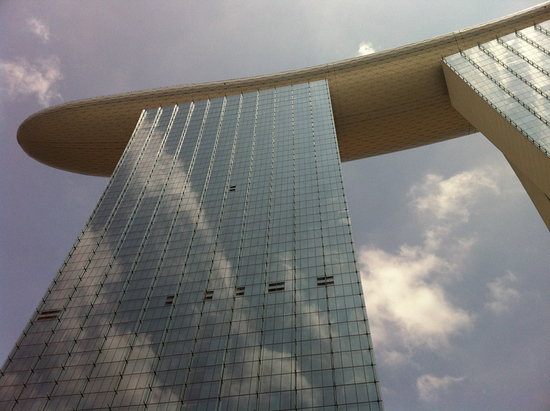 Unsurprisingly, given how dominates Singapore’s skyline, the Marina Bay Sands complex is absolutely huge. Wandering around it is quite a feat itself and will definitely take several hours. 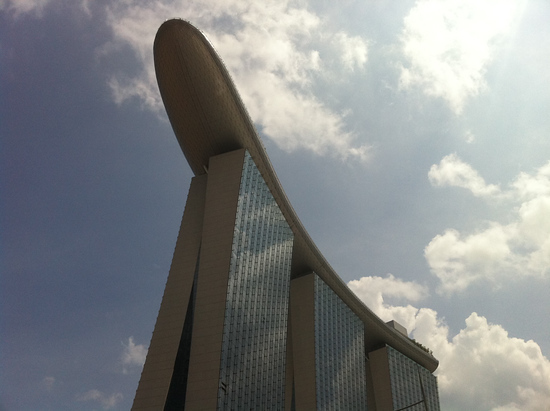 The Marina Bay Sands hotel – this is the already iconic “three pillars and a plank” building that is the main focus of the Marina Bay Sands complex. It’s a stunning building both up close and from a distance. The way the clouds reflect in the building’s windows is spectacular. 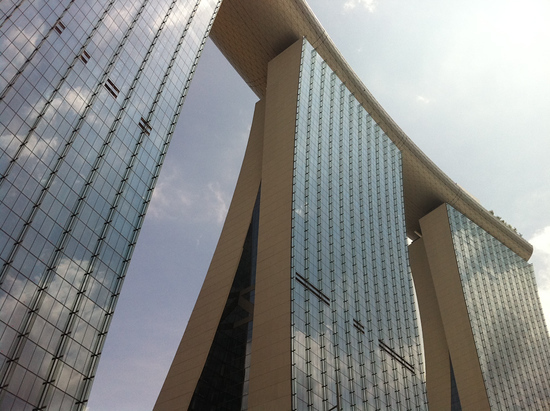 While the Marina Bay Sands Hotel is built primarily to service the Marina Bay Sands Casino, don’t expect great rooms at cheap Las Vegas prices here – rooms at the Marina Bay Sands hotel start at $US 350. This is definitely high roller territory. The SkyPark at the top of the Marina Bay Sands hotel is the perhaps the main attraction for most visitors to Singapore who aren’t already staying at the Marina Bay Sands hotel or coming to play in the casino – 200 metres above the ground, the SkyPark provides stunning panoramic views of Singapore. See my post Singapore’s SkyPark for more information and pictures of the views. Price is $S20 per person. 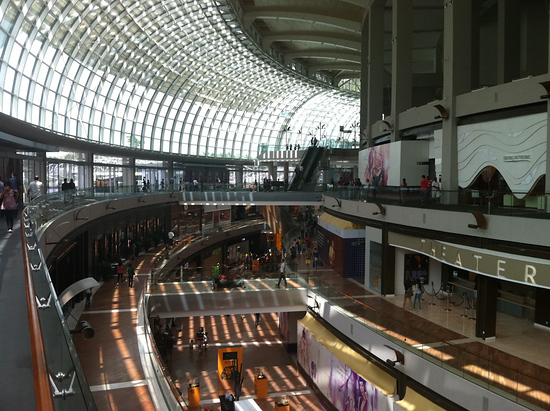 Shoppes At Marina Bay Sands – this is the huge but low rise glass and steel building directly in front of the Marina Bay Sands hotel. It houses the casino, the expo centres (including the largest ballroom in South East Asia), performance theatres and cinemas, along with the usual plethora of brand name shops. 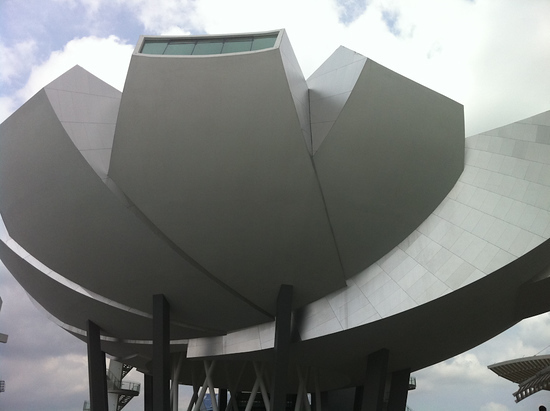 The ArtScience museum is a striking bulding in front of the Shoppes, looking like a cross between an opening flower and Darth Vader’s sleep pod, this is an innovative approach to showcasing how art and science intermix, with permanent collections and continually changing visiting exhibitions too. 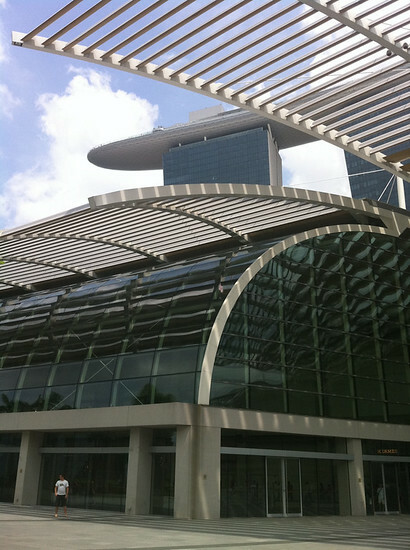 Marina Bay Sands is about 1000 m walk from Marina Bay MRT – go out of Exit B, turn right – you can’t miss Marina Bay Sands as it’s visible as soon as you walk out of the station. There is apparently a free shuttle bus to take you from the station to the Marina Bay Sands complex, but I didn’t see one when I visited. A more pleasant way to approach the Marina Bay Sands – although perhaps a little longer walk – is to get the Metro to Esplanade and walk around the Bay Area from the Esplanade Theatres and then along the futuristic bridge that leads into the complex. 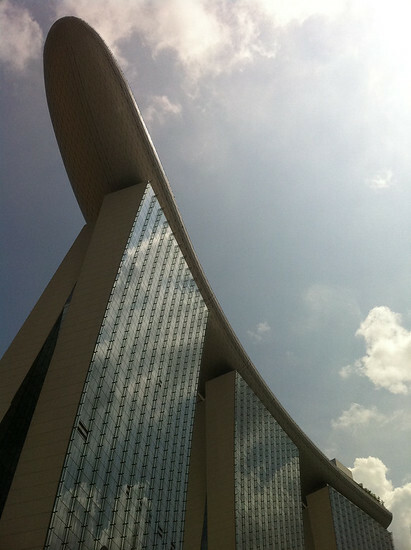 The entrance to the Singapore SkyPark is near to the exit from the Bridge so it’s convenient for that. If you can’t afford to stay at Marina Bay Sands hotel, Singapore is compact enough to stay pretty much anywhere else in the city and still be able to get there relatively quickly. Good budget hotels nearby include Ibis Singapore -check Agoda for current central Singapore hotel discounts. There are also several excellent Singapore backpacker hostels too.